There are 96 players remaining in Event #5 $365 NLH Monster Stack. The top 45 players will make the money. While the rest of the field has 200,000 chips or less, Bob Ricciuti has found himself as the tournament chip leader, sitting on 312,000. He shares a table with Mike Nye, who sits on 63,000. 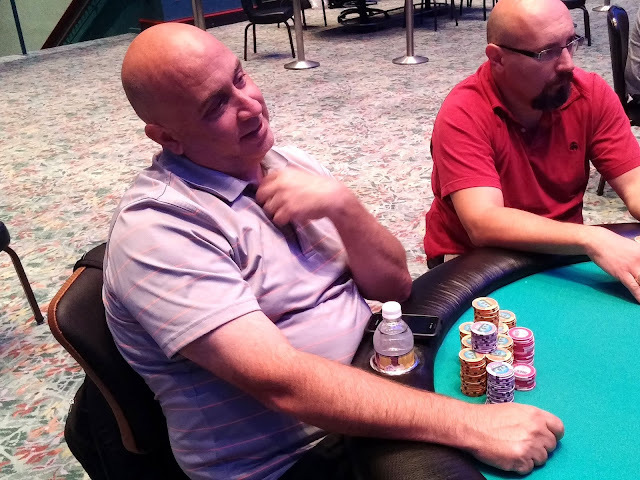 Paul Zarcone has won Event #4 $365 Omaha/8. 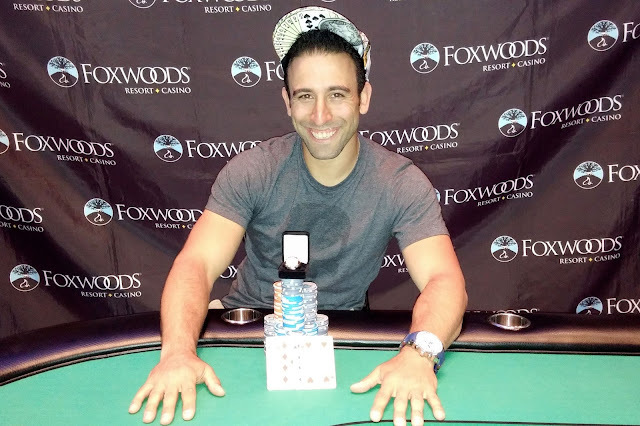 He will take home $10,645 along with the title and a World Series of Poker Circuit ring. Congratulations, Paul. On a [2c][9c][Th][2h][3c] board, Thomas Dragone was all in and was called by Philip Shing. Thomas had rivered a flush with his [Jc][5c], but Philip had rivered the nut flush with his [Ac][7c]. 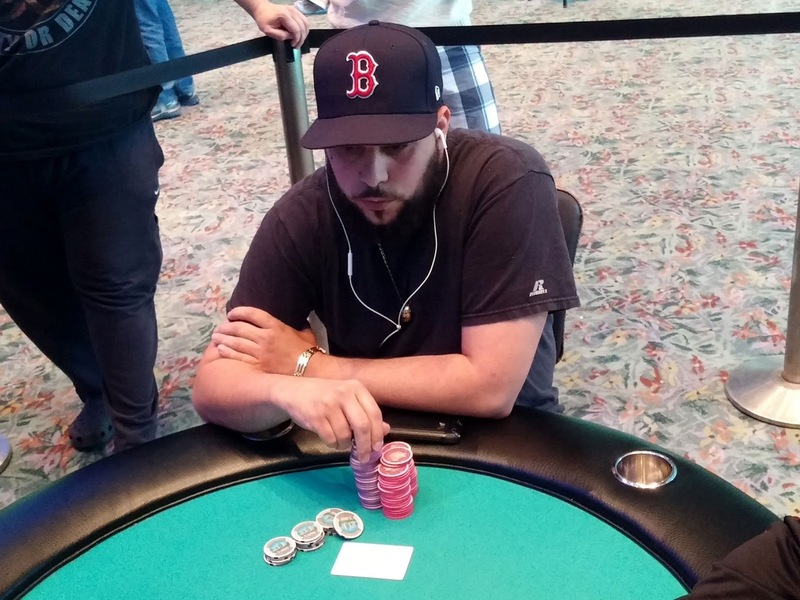 Thomas will finish Event #3 $580 Six-Max in 2nd place and collect $9,731. 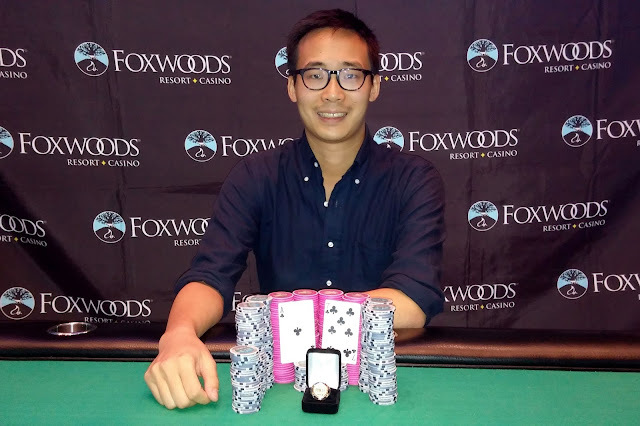 Philip Shing will take home the title, the first place prize of $14,543, and a World Series of Poker Circuit ring. Congraultions, Philip! 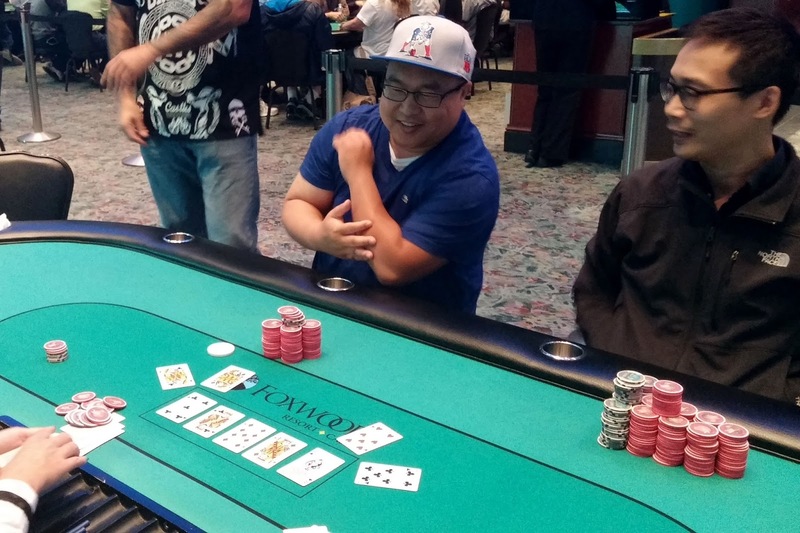 Aristoteles Neto was all in preflop holding [Kd][Js] and was up against the [Ac][8s] of Philip Shing. Philip would knock yet another opponent out at this final table when the board ran out [4d][Ts][2d][7c][2s]. Aristoteles will finish this tournament in 3rd place, good for $6,389. Soukha Kachittavong was all in preflop holding [7h][7c] and would need to get lucky against Tom Dragone's [Qd][Qc]. Soukha failed to find a seven on the [5c][Kc][9d][Jd][As] board, and he will be eliminated in 4th place, good for $5,053. On a [2s][8h][Jc] flop, Welther Marmol was all in holding [Ks][Jh]. Welter's king kicker was no good as Philip Shing held [Ac][Js]. The [2d] turn and [6d] river failed to improve Welther, and he will exit Event #3 in 5th place, good for $3,823. 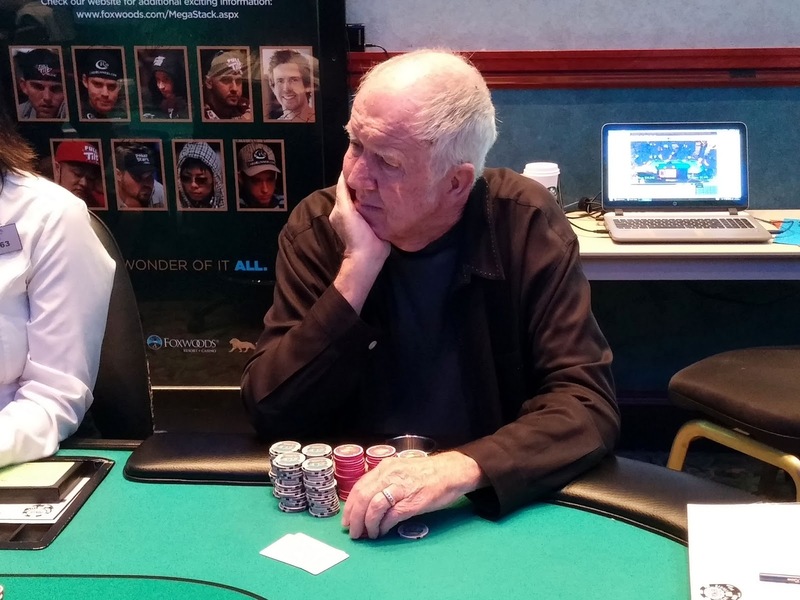 In one of the first few hands at the final table, Baruch Thaler moved all in and was called by Philip Shing. Baruch's [3h][3c] was in bad shape against Philip's [Kd][Kc]. The [Qc][Ac][6d] flop was no help, nor was the [4d] on turn. The [As] hit the river, eliminating Baruch in 6th place, good for $2,941. It's 1pm, and there's a whole lot of activity for a Monday at Foxwoods Resort & Casino. Event #3 $580 NLH Six-Max has returned to begin their final table, and is streaming live at www.FoxwoodsLive.com. 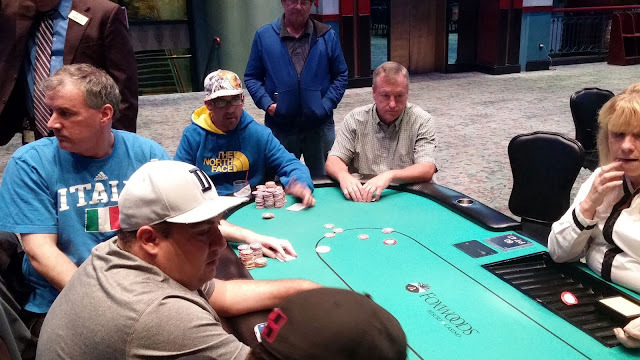 Event #4 $365 Omaha/8 has returned with the final 12 players, and within moments two players have been eliminated and they have reached their final table. 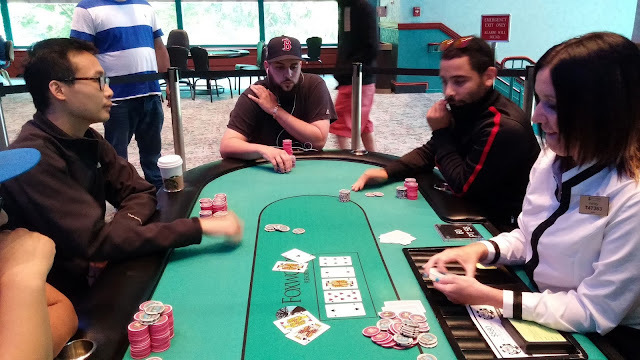 Event #5 $365 NLH Monster Stack has just taken their first break of the day. The board reads 333 entrants so far. Levels will be 40 and 50 minutes. 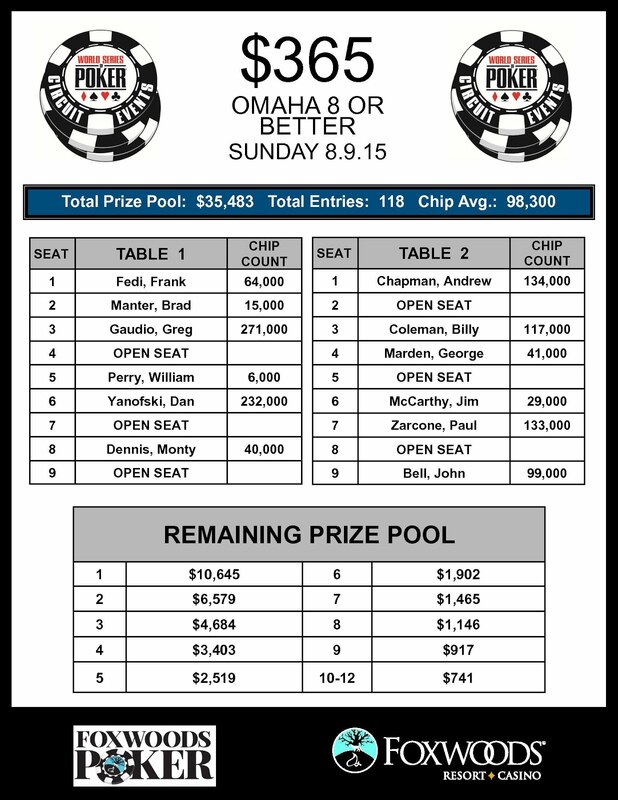 Chip counts and seating assignments are available here. At 4,000/8,000 blinds, a player was all in for 1,000 in the big blind. Multiple players saw the [6s][Jd][9c] flop, and there was a bet and two callers. The board ran out [7c][Ah] and one player had [9s][9d][5d][3h] to beat the all in player's [Jh][8d][6d][3c]. 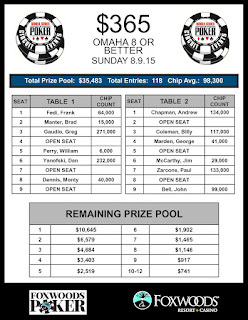 Event #4 $365 Omaha/8 in the money, and the final 12 will return for Day 2 at 1pm to play down to a winner. Event #4 $365 Omaha/8 is down to the final 13 players, so play will not end as scheduled. The tournament staff has decided to let the players play until the money bubble has burst before bagging up for the night. 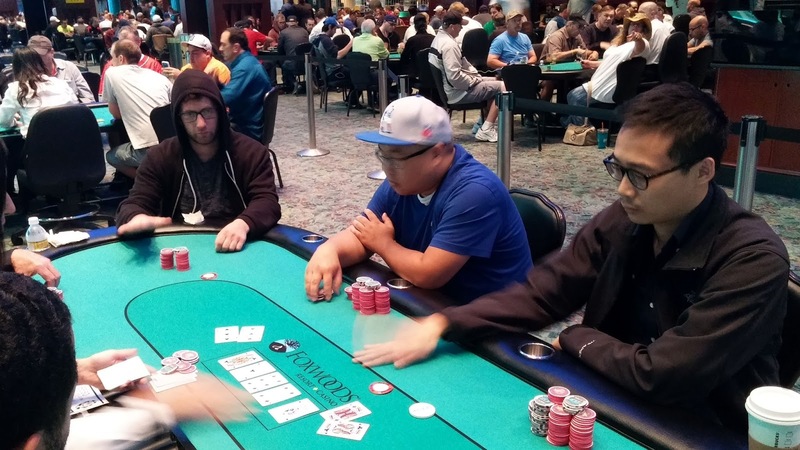 One player has 1,000 in chips remaining, so the bubble likely won't last long.